Sensory gardens can be wonderfully therapeutic experiences. During a single trip, visitors can enjoy having all five senses stimulated through varying landscapes, tactile materials and vibrant foliage. Most sensory gardens are fairly small, contained spaces, designed for easy navigation. They are also safe places for people to enjoy the gentle stimulus of the surroundings—ideally triggering happy memories and encouraging feelings of calm, relaxation and wellbeing. Seating areas such as chairs, benches, ledges or large boulders placed in such a way to encourage visitors to get the most out of where they are. Dementia Resource Centre sensory garden (Dundee, Scotland) was recently opened by Alzheimer Scotland. It includes a multi-sensory experiential garden, a summer house and pergola, raised flowerbeds with seasonal foliage and bird feeders to encourage wildlife. It’s a lovely, relaxing, safe space for people to enjoy. Kiplin Hall (North Yorkshire) offers variety of interesting scents, sounds, textures and colours which make up the very cleverly constructed sensory garden. Sensory Garden at Aden Country Park (Aberdeenshire, Scotland) features both edible and scented foliage—as well as plenty of wildlife—to provide stimulation for all the senses. St Anthony’s Hall Sensory Garden (York) is a perfect example of what a sensory garden can offer. It has accessible walkways throughout, raised beds to bring scent and colour to eye level and both tactile and edible plants. Wyndham Park in Grantham (near Nottingham) has a lovely sensory garden with many features to stimulate all the senses. Beds filled with a variety of fragrant, tactile and colourful plants are changed regularly to keep the garden in bloom throughout the year. There are also several carefully placed seating areas and viewing spots where visitors can get the most out of their experience. The park also showcases a large wooden sculpture of a hand holding an apple. Hand-carved from a tree trunk, this very interesting focal point is definitely worth a look! Kyoto Gardens (Holland Park) recreates a Japanese-style showcase filled with relaxing places to sit and enjoy the tranquillity of the garden. There is even a beautiful waterfall stocked with swimming koi carp! Lavender Garden at Vauxhall Park (South London) is an inner city green space. Swathes of lavender are in full bloom in the summer months, producing soothing aromas for those who visit. Parkland Sensory Gardens at Imperial Park (South London) are specifically designed to stimulate a visitor’s sense of smell, touch and sight through their enjoyment of the varied foliage that changes during the year. St George’s Sensory Garden (St Pancras) was designed specifically for those with visual impairments. It was inspired by the arrival of the RNIB to the area. It took three years to cultivate and opened in 2008, showcasing features such as horseshoe-shaped hedges. Seating areas throughout ensure visitors are always close to the surrounding nature, and an array of sweet-smelling plants stimulate the sense of smell rather than sight. 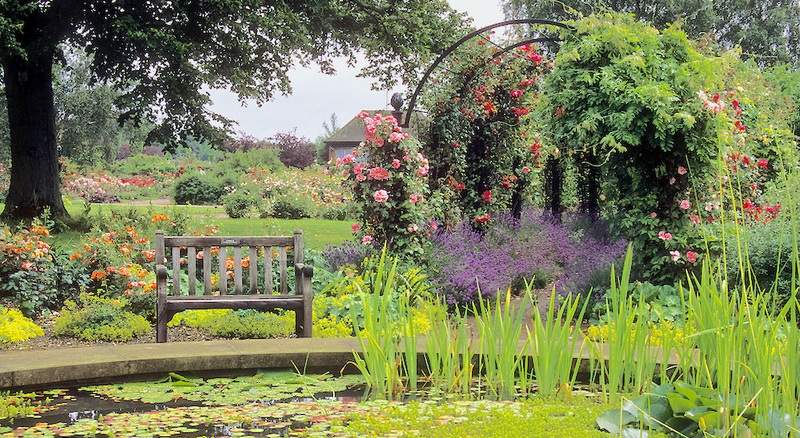 Abbey Gardens (Bury St Edmonds) was initially designed to be a sensory garden for visually impaired visitors to enjoy, via an abundance of scented plants and herbs. It has now been developed further to stimulate all the senses. Newer features include brightly coloured borders, a water fountain with a pebble-work surround, plus tactile maps and plants. Eden Project (Cornwall) provides a feast for all the senses. They are working closely with The Sensory Trust to ensure that as many of the attractions as possible are available to all visitors. For example, their spectacular Rainforest Canopy Walkway is almost entirely accessible to wheelchair users. Egerton Park in Bexhill-on-Sea (East Sussex), was originally opened in 1951 as a scented garden for people with sight loss. Over the years, it has been gradually cultivated to become a sensory garden for all visitors. Newer features now include a range of interesting sculptures dotted around the garden, as well as varied foliage specifically chosen to stimulate all five of the senses. There is even a freshwater pond. Fairhaven Woodland and Water Garden (Norfolk) has been designed with specific attention to the potential needs of visitors with mobility issues and visual impairments. Amongst many features, there is also a series of braille panels added to information boards throughout the garden, offering a more detailed description of the surrounding foliage. Jephson Gardens (Leamington Spa) is situated within a beautiful Victorian park and has stimulation for the senses through a variety of interesting plants. There is also a taste garden, a mirrored arch and a xylophone which can be played by visitors both young and old. Mannington Gardens at the medieval moated manor house, Mannington Hall, in Norwich are spectacular. A recently planted Sensory Garden was specifically cultivated with foliage selected to stimulate touch, sound and taste, as well as smell and colour. Page Park Sensory Garden in Staple Hill (Bristol) was designed with the needs of different disabled groups in mind and includes fragrant plants and a water feature with chimes. The garden was created using funds raised by the Friends of Page Park. Creative Activities for Carers. This blog from the Sensory Trust is dedicated to exploring a range of tried and tested nature-based activities. Make sure to take a look at other dementia-friendly spaces and activities on the Sensory Trust site. Gardens and gardening for people with dementia. As part of a series of briefing sheets from the charity, Thrive, this downloadable document is full of helpful technical information. Memory Garden for People with Dementia. The National Dignity Council has provided this brief article that explores the connection between memory loss and sensory stimulus. It also covers the basics behind setting up your own simple sensory garden, including practical tips and safety considerations. If you do take a trip to any of our recommended gardens, be sure to use our Contact us form and tell us about your experience. Also, if you stumble across any sensory gardens not listed here, please tell us so we can check them out and add to our list of recommendations. You can also share your thoughts on sensory gardens by adding a post to our online Forum. It’s great way to connect with other members of the community. If you haven’t registered already, now would be a great time. Finally, if you've been inspired by your sensory adventures, why not try your hand at a spot of gardening, either indoors or outdoors? You might be surprised at how rewarding and easy it is. Find tips and advice on gardening at home right here on Jewish Care Interact.